Using your own phone inside of your work environment can be terrifying because of two words: remote wipe. Fortunately, the more granular admin controls inside the new versions of Outlook’s Android and iOS apps should help soothe your fears. The new preview of Outlook for Android and the full-fledged version of Outlook for iOS include a PIN lock, helping secure your phone in case it gets lost or stolen. And your IT admin can simply erase your email without resetting the phone itself. Outlook for Android now supports IMAP services. Why this matters: Your IT department is vigilant about protecting confidential company data—and one of the more obvious holes is your phone and the company email stored on it. If your company enforces a strict policy, it can reset your Android phone to its factory settings—the “remote wipe”—if you report it missing. (Because Apple encrypts iPhones by default, admins can usually wipe your email without problems.) That’s why many Android users use a program like TouchDown HD or Samsung’s KNOX to wall off their email in a partition. If the “remote wipe” command is issued, only that partition will be erased, and not your photos, contacts, downloaded files, and other personal stuff. Fortunately, the new Outlook app for Android and iOS does the same. “This is a selective wipe, not a device wipe: corporate email, calendar, contacts and files are removed, but a user’s personal email accounts and information stay intact,” a Microsoft representative said via email. 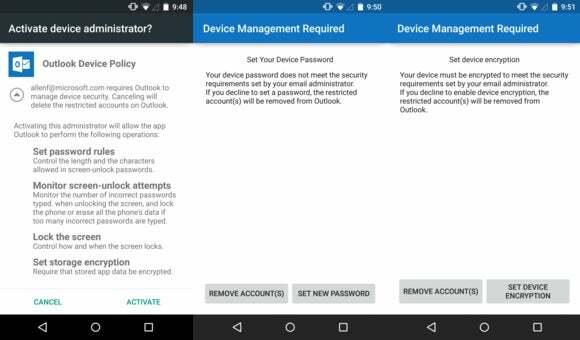 With the new versions of Outlook for Android and iOS, passwords are enforced using Exchange ActiveSync. In practice, that means adding a PIN or a password to unlock your phone. (The same policy will be enforced differently on different phones. My Samsung Galaxy Note 3 required a password to unlock my phone and use it with my employer’s email, while an LG G3 required a simple numeric PIN to do the same.) On Android, you’ll also have the option to encrypt the entire phone, not just the email. The settings menu for Outlook for iOS. Outlook for iOS runs only on iOS 8.0 or later. These devices are shipped with built-in encryption, Microsoft noted, which Outlook uses once the passcode is enabled to encrypt all the data Outlook stores locally on the device. Therefore, iOS devices will be encrypted regardless of the Office 365 or Exchange policy. Note that if you fail repeatedly to enter the correct password (on our Android test phone, it was ten times) the phone will factory reset, and you’ll lose all of your personal data. But if your IT department remotely wipes the phone, it can do so by wiping the app itself. 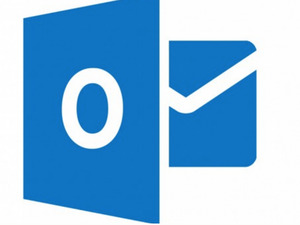 The Outlook app also now connects to email services that use IMAP, like Comcast, and it can use the IDLE command to receive push notifications. Outlook has a unique feature for iOS, threaded email, which Android lacks. Outlook for iOS (and now Android) also allows you to control how you’d like swipes to be handled. Swipe right, and email can be scheduled to be read later. Swipe left, and you can archive it for later. But the default behaviors can also be adjusted. You can also create new folders to store the swiped email. What’s next? Better language support and local syncing of contacts, a feature that’s overdue. About the only issue I found was an odd one: The option to uninstall Outlook for Android is a bit tricky to, well, uninstall. Here’s the clunky process: Go to Settings > General > Security > Device administrators and uncheck the Outlook Device Policy. You’ll then need to go to the Device > Lock Screen setting to adjust that setting to what you, rather than your IT department, prefers—then uninstall.